Built by Douglas. Constructor Number 10000. U. S, Army Air Force serial number 42-24138. During August 1943, assigned to the Royal Australian Ar Force (RAAF) serial number A65-18. Call Sign VH-CTR. Assigned to 33 Squadron, then 38 Squadron. Later, 9 Communication Unit. 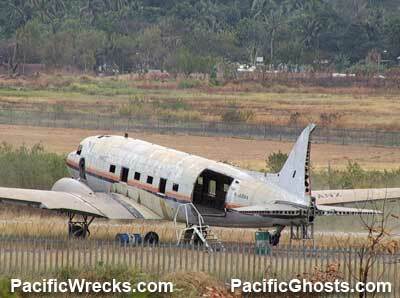 This aircraft was converted to a DC-3 and acquired by Qantas. On May 31, 1948 registered in Australia as VH-EBE. Next, owned by Trans Australian Airlines (TAA) and registered as VH-EBT on September 1, 1960. Operated in New Guinea by TAA nicknamed "Cape Hoskins" and registered as VH-SBB. Acquired by Air Niugini on September 14, 1973 and registered as P2-SBB on June 2, 1974. Next, registered as P2-ANN on November 11, 1975. Withdrawn from service on July 31, 1977. 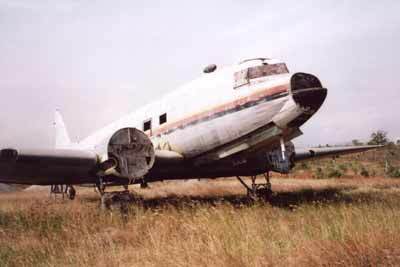 Afterwards, owned by Insured Aircraft Title Service Inc and registered as N5590K. Used by the Red Cross for aid work in Thailand. Aquired during October 1981 by Bush Pilots Airways. Finally, used for spare parts and stored outdoors at the far end of Jackson Airport near the entrance to the PNG Defense Force area. The Air Nugini P2-ANN markings are still visible, but all instruments and engines are removed.